Potatoes in eastern North Carolina are currently grown to meet the needs of two very important spring potato markets. The first is the chipping industry, which comprises roughly 60% of NC’s crop. 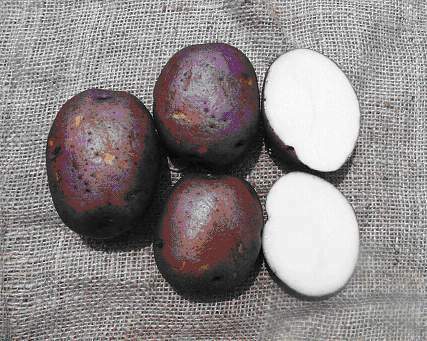 The second market is comprised of round white- and red-skinned tablestock potatoes. Within the tablestock market, a demand exists for gourmet or novelty potatoes for restaurants, grocery stores, and individual consumers through roadside or tailgate venues. Based on NC’s already strong and viable potato industry, it is feasible and profitable for growers in this area to become suppliers for the spring specialty-type potato market for parts of the East Coast. Potatoes in eastern North Carolina are currently grown to meet the needs of two very important spring potato markets. The first is the chipping industry that comprises roughly 60% of NC’s crop. The other is the tablestock market comprised of round white and red skinned tablestock potatoes. Within the tablestock market there exists a demand for gourmet or novelty potatoes to serve not only restaurants, but the individual consumer as well. Currently, we have identified one clone, designated B1816-5, a purple-skinned, yellow-fleshed potato bred by Dr. Kathy Haynes, USDA-ARS, Beltsville, MD, that may have potential in NC. We have already spoken to Dr. Haynes regarding our desire to further evaluate and possibly release this clone in NC and she is amenable to the idea. It is now in tissue culture at Cornell University’s Uihlein farm for the express purpose of increasing seed stocks. This clone was demonstrated at the 2002 and 2003 SCP Field Day at the Cunningham Research Station, and was very well-received. It appears to be well adapted to NC’s environment in that it yields well, is attractive and is very tasty. It is our desire to evaluate the market potential of this clone as well as to test others that may have potential as gourmet or specialty-type potatoes. The skin and flesh color of B1816-5 have a particular attraction to some in eastern NC (e.g. alumni of East Carolina University whose school colors are purple and gold) and we believe that with appropriate advertising this new variety could be readily marketed to restaurant chefs and/or those who would typically buy the higher priced gourmet potatoes. The increased nutritional content of yellow fleshed potatoes (they provide over 40% of the RDA of vitamin C) and the fact that most yellow-fleshed potatoes contain higher levels of lutein, a carotenoid plant pigment that has been shown to reduce the risk of macular degeneration and is thought to reduce the risk of heart disease, can be used to enhance their marketability. Three variety trials were conducted to evaluate and compare B1816-5with other released and experimental cultivars. The Tull Hill Farms and the Northeast Regional NE-1014 Potato Variety Development Project Red Trial (NE-RD) were composed of red and purple varieties with 13 and 12 clones, respectively. The James Brother’s trial included red, white and purple cultivars and consisted of 23 clones; 15 white, 6 red and 2 purple. All trials were planted in a randomized complete block design with 4 replications. Plots consisted of one row with 28 hills spaced 9 inches apart. Spacing between rows was 38 inches at all sites, with the exception of the James Brother’s Trial, which was on 40 inch row spacing. The on-farm trials were dug using a single-row digger and hand harvested. The NE-RD was harvested using a two-row harvester modified to dig one row at a time. Both grower trials were graded using a portable Lockwood Grader which sorts to two grades: A+B’s &ge’ 1 7/8”; and C’s < 1 7/8”. The NE-RD was graded to five classes: 1’s < 1 7/8”; 2’s > 1 7/8 to 2 1/2”; 3’s > 2 1/2 to 3 1/4”; 4’s > 3 1/4 to 4”; 5’s > 4” using the potato grader at the TRS. Culls were removed and weighed separately in all trials. Each clone was evaluated for tuber quality and appearance during grading using standardized NE-1014 rating codes. A description of the rating codes is provided in Appendix 1. Only the most promising varieties are screened in this trial because of location. We typically invite the NC Potato Association to tour this site in May during their annual meeting in Elizabeth City. As a result this trial contains chip, table, and specialty market potatoes. This year only two clones evaluated can be considered specialty potatoes: B1816-5 and Michigan Purple. For the purposes of this report we will compare these materials to the red skinned potatoes also evaluated in the trial as well as the white skin / yellow flesh potatoes. The standard red, Chieftain, had a marketable yield of 202 cwt/A. 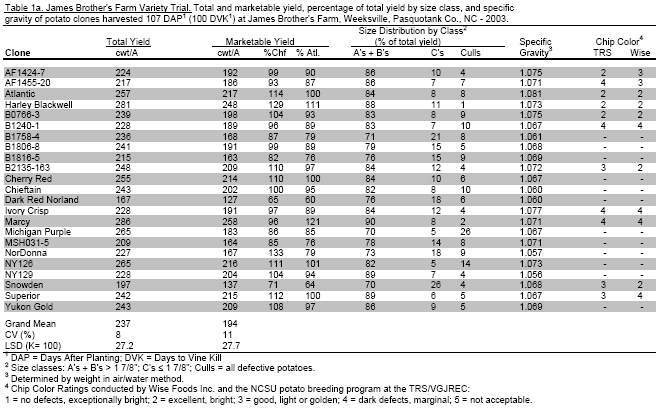 Three clones (Cherry Red, 214 cwt/A; NY129, 209 cwt/A; and Yukon Gold, 204 cwt/A) had greater marketable yields though none were significant. B1816-5 had a marketable yield of 82% and Michigan Purple was 86% of Chieftain. In terms of appearance NorDonna had the best overall appearance at 7 or good. B1816-5 had an overall appearance score of 5 or fair, which was somewhat unusual as this clone generally looks better. Michigan Purple had a rating of 4 due largely to lots of skinning and the presence of scab, common problems observed in this clone. B1816-5 had no internal defects and culls were due in most part to growth cracks and misshapes. Michigan Purple had 3% soft rot but no other internal problems. Of the thirteen clones in this trial four had purple skin (B1763-4, B1816-5, B1952-2, and Michigan Purple). All other clones in this trial were red skin / white flesh potatoes. Chieftain had a marketable yield of 339 cwt/A. None of the other clones in the trial exceeded the standard though many had statistically similar yields (this includes all four purples). The only clone with an overall appearance score of 8 was NY129, a round red from Cornell University. Clones with overall appearance scores of 7 were: B1758-4; B1952-2; and NorDonna. B1816-5 had an appearance score of 6. The only clone with percent Internal Heat Necrosis (IHN) levels greater than 10% was Chieftain (25%), but the IHN severity rating was not exceptionally serious at 7.8. The only purple with IHN was Michigan Purple at 8%. 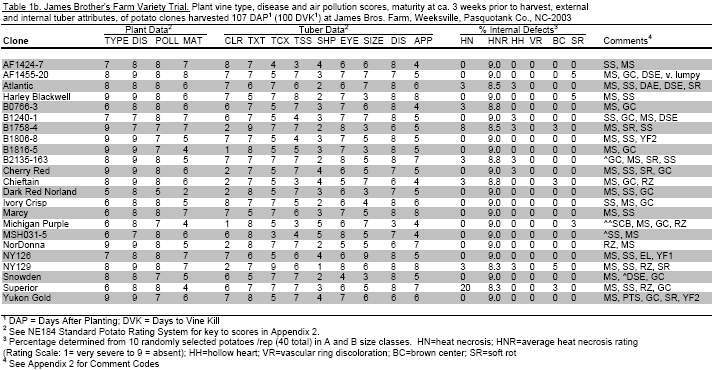 Clones with greater than 10% vascular ring discoloration were B1952-2 (23%) and LaRouge (13%). The most common external defects were soft rot, misshapes, skin blemishes attributed to Rhizoctonia, and silver scurf. Many of the varieties in this trial are also screened by collaborating institutions from Florida to Maine and Ohio. The purple skin clones (B1816-5 and Michigan Purple) were not part of the multi-state screening. Chieftain, had a marketable yield of 168 cwt/A. Seven of the 12 clones in the trial had higher marketable yields than Chieftain but were not statistically different, including both B1816-5 (177 cwt/A) and Michigan Purple (213 cwt/A). NY129 was the only clone to have an overall appearance rating of 7. Among others B1816-5 had a rating of 6 and Michigan Purple was rated a 4, one of the lowest in the trial. Overall, internal defects were slight and only one clone, B1758-4, had incidence of soft rot at 10%. Culls were due mostly to silver scurf, misshapes, growth cracks, and skin blemishes attributed to Rhizoctonia. B1816-5 (fig. 1) has an attractive dark purple skin and yellow flesh. Its susceptibility to silver scurf caused the overall appearance score to be lower than what it might have been if the seed were treated with a fungicide at planting, which was not routinely done. Silver Scurf is a fungal pathogen on the surface of the potato that does not affect internal quality. Also, it is increasingly noticeable the longer a potato is held in storage. We submitted this clone to Melissa’s for culinary testing and because of the silver scurf they stated it would not meet their needs as this pathogen detracts considerably from external appearance. Acknowledging this, we will continue to test this clone though we will need to treat some seed in a plot setup specifically for marketing, or work with a grower who would be willing to treat the seed. Currently, we have 150 lbs of seed that we intend to designate for this purpose. We will submit new samples to Melissa’s in 2004. Michigan Purple (fig.2)) was also included in each of the trials. It is a high yielding purple skin, white flesh potato. We consistently rate this clone with a low appearance score but this is largely due to excessive skinning and its high susceptibility to scab. 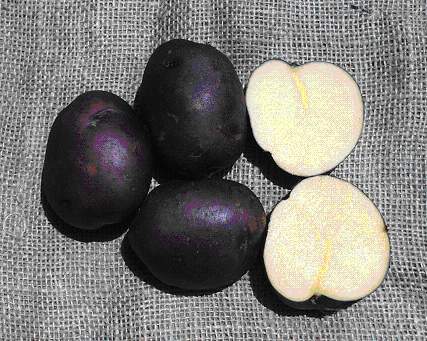 Growers (organic and conventional) who take special precautions to minimize skinning and do not have scab problems, and/or home gardeners who hand harvest potatoes might be the appropriate market for this unique potato in NC as it is flavorful, and its smooth light purple skin and white flesh are very attractive. Other purple clones included in the Tull Hill Farms trial are still relatively new to our program and we have requested them again for further testing in 2004 from the USDA-ARS breeding program. The likely markets for these potatoes are restaurants, grocery stores, road-side stands and individuals desiring a gourmet potato. The unique attributes of B1816-5, coupled with its excellent culinary qualities make this an especially attractive specialty-type potato. Also, because of its purple and gold skin and flesh colors, it has the added advantage of having a fan-based market in eastern NC for East Carolina University as this potato matches ECU’s school colors. Based on NC’s already strong and viable potato industry, we envision that certain grower’s could become a supplier to the spring specialty-type potato market for parts of the East Coast. • Extension@YourService: Sweet Potato Season Once Again!